...... You simply pick the files to convert, choose an output format, and click a button to start the process. Everything happens automatically.It's amazing! 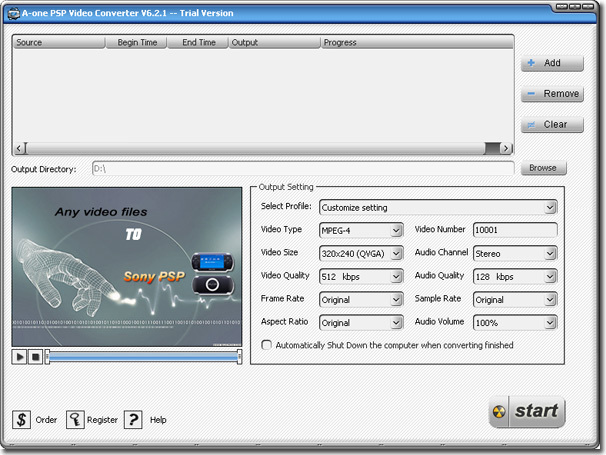 A-one PSP Video Convertor will become your best choice. we are providing free technical support,30-day refund guarantee and free update. (4)Convert various video file formats to MP4 for PSP. Qweas is providing links to A-one PSP Video Convertor 6.9.31 as a courtesy, and makes no representations regarding A-one PSP Video Convertor or any other applications or any information related thereto. Any questions, complaints or claims regarding this application A-one PSP Video Convertor 6.9.31 must be directed to the appropriate software vendor. You may click the publisher link of A-one PSP Video Convertor on the top of this page to get more details about the vendor.